I remember thinking this API was rather cool when Jeremy Skinner presented the syntax on his blog. The syntax became the topic of discussion in a recent Stack Overflow post - Abuse of C# lambda expressions or Syntax brilliance? I don’t think one of the goals of C# is to “be like Lisp”, but I like the code, and it reminds me of a 1993 essay by Paul Graham titled “Programming Bottom-Up”. Experienced Lisp programmers divide up their programs differently. As well as top-down design, they follow a principle which could be called bottom-up design-- changing the language to suit the problem. In Lisp, you don't just write your program down toward the language, you also build the language up toward your program. As you're writing a program you may think "I wish Lisp had such-and-such an operator." So you go and write it. The project I’ve worked on for the last part of the year was a huge technical challenge. I bent the hell out of C# to try and make something that was easy to read and maintain. Looking back now, I can see a lot of mistakes and plenty of room for improvement, but I also believe if the project didn’t use some tricks with extension methods and Expression<T>, we’d be facing 3x the amount of code and 3x the complexity. Since that time I’ve become a big believer in bending languages. You have to look past the tricky implementation details and see the bigger problem being solved. I love clean, simple and clever code. But isn't "bending the hell" out of language just another type of complexity? Think also about the poor sod that's not half as smart as you who has to maintain the code 1 year/5 years/10 years down the track (though I don't know if that's likely to be the case in your particular situation). Code that's hard to write now is always 10 times harder to maintain later. @Jason - I agree it is a type of complexity. In the project I've been working on I think about it a lot and it sometimes keeps me awake at night. I still think it's better than the alternative (one brute force approach I spiked had massive amounts of cyclomatic complexity), but sometimes I wonder if I used the right language for that particular job. Why use all that expensive reflection machinery when you could just use the collection literals? Is it to avoid typing "quotes" around your keys? Is this really seen as an abomination in the C# community? It's a hack for sure. One thing to point out is that this is completely optional. All methods that take a 'lambda hash' also take an IDictionary as a separate overload. This approach really isn't very expensive at all (see blog.bittercoder.com) and if you don't like it, you can always use a Dictionary + collection initializer. The idea wasn't to avoid quotes but to just make something that's a bit shorter to type. I did something similar for an ado.net wrapper that I released on CodePlex (called SqlSiphon if you care to search, I won't spam the link directly). It's a series of methods in a class that is meant to be subclassed to make a data access layer for a project. You add methods to this subclass that exactly match the names of the stored procedures in your database. The code then walks the stack trace looking for your method (tagged by an attribute) and uses the names of the method and its parameters to construct the SqlCommand object needed to execute the stored procedure. It does some more shenanigans to process the results, but maybe you get the idea. Like I said, if you're really interested to see the tomfoolery, you can find it on CodePlex. LINQ and lambdas are hugely important for it, the C# 2.0 version (necessary for some projects here at work) is easily twice as long. Yikes! That just blew my mind. I love it. I had somehow never considered using the name of the func argument before. I love the Paul Graham quote, and while LISP'ers can do basically anything they want with their language, we can still raise the bar in C# with things like this. My take: Beautiful; not a hack. This sort of thing can be evil in the same way that C++ macros are often evil. I don't want to see C# become a language where understanding an arbitrary code base involves understanding how the language was bent by those particular developers. Not unless there's a mighty damn good reason for it, beyond "wow, Dude, this is COOL!" I think it is an elegant syntax, my only problem is that it is not exactly a conventional way of doing things in the C# world, to the point where it would not even be usable unless the person read the documentation before using it. I think it is a beautiful way to push the language into interesting places. What I am saying is that it completely violates the principal of least astonishment (en.wikipedia.org/...), which is something you should strive for in public code. Personally I feel these kinds of hacks are an indicator of a missing language feature, rather then something elegant (much like design patterns can be). In this case I would much rather see language level support for symbols / more succinct dictionary initializer syntax. Or even better, support for AST macros / compiler pipeline extensions, like the often used "@symbol" => string transformation you see in many Boo-based DSL's. I gotta say as a Rails developer it's really weird to see people flipping out so hard about this. "I mean - nobody expects the name they pick for a parameter at compile time to be so important during runtime." This is a fundamental part of Rails development, and part of the reason it's so quick to write Rails apps. Great post, I have to go with avoiding this as the anonymous type object has been working great for me in MVC. This does seem to go against the purpose of lambdas and adds unnecessary complexity. 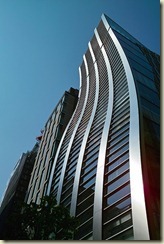 Also - I saw that "bend" building in tokyo, and took my own picture! haha nice coincidence, especially as it was sort of hidden on a side street! IMHO the holy grail of code quality is code that just lets you express your intent without the unnecessary noise of the language constructs (or work around hacks because of the lack of language features). This is effectively the same goal of DSL's. As long as it remains intuitive to read then I have no problems with API's that 'bends the language'. I like the clever bending of the language, just not for this. Personally, I prefer to look at html when in the view, not something designed to hide it. If I wanted to hide my html I would have stuck with web forms. The part here that's not beautiful is the C# itself. This would be a much more beautiful in boo or a DSL. "Why use all that expensive reflection machinery..."
I just wanted to point out that this probably doesn't use reflection at all. In C# when you write a lambda expression it will be compiled into 1 of 2 things, either it will be compiled into an delegate if the parameter type it is used as is a delegate (for example Func<T>) or it will be compiled as an expression, or Expression<Func<T>>. In the case of the expression, you can inspect the lambda, including parameters, without requiring reflection in the .NET sense (as in the System.Reflection API). I've seen the right hand side used this way before and it's pretty useful for things but not the left hand side. So for people who are concerned about performance due to reflection costs can be relieved a little bit. Not that its free to look up the parameter name but it's extremely trivial (and cache-able if you're really worried). The basic rule of thumb is that code is twice as hard to maintain as it is to write. If you're writing code you consider clever you are, by definition, not qualified to maintain it. The cat is out of the bag. They're going to take it and run with it. There is no going back. We've past the final threshold. Opinions are obsolete. @Benjamin: Use the @ symbol, as in @class => "myCssClass" should work.